Dell XPS 13 with Ubuntu -- The Ultimate Developer Laptop of 2018! 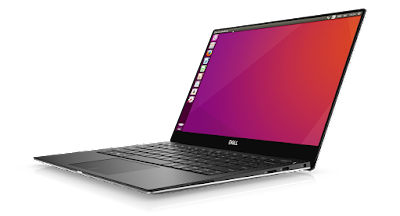 I'm the proud owner of a new Dell XPS 13 Developer Edition (9360) laptop, pre-loaded from the Dell factory with Ubuntu 16.04 LTS Desktop. 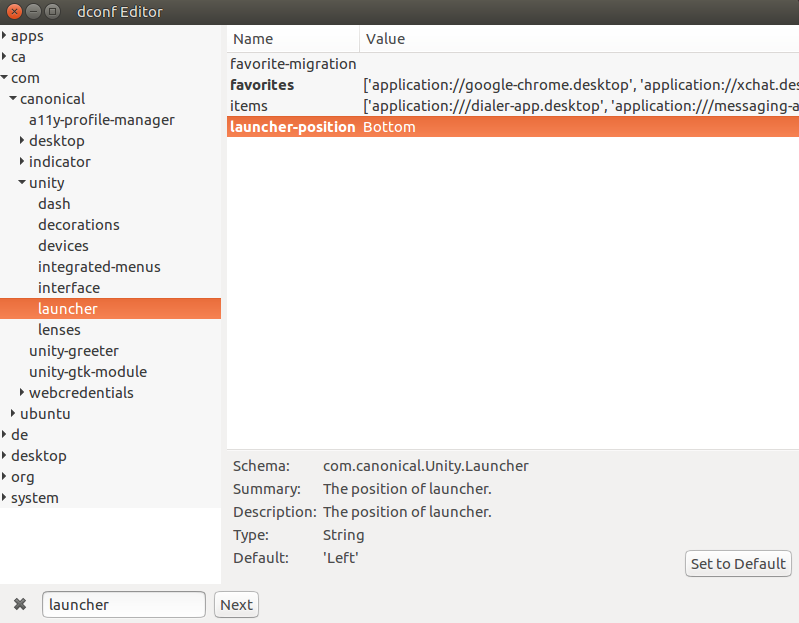 Kudos to the Dell and the Canonical teams that have engineered a truly remarkable developer desktop experience. You should also check out the post from Dell's senior architect behind the XPS 13, Barton George. Now, this latest XPS edition is a real dream of a machine! The 500GB NVME storage and a whopping 1239 MB/sec I/O throughput! The keyboard is super comfortable. I like it a bit better than the 1st generation. Unlike your Apple friends, we still have our F-keys, which is important to me as a Byobu user :-) The placement of the PgUp, PgDn, Home, and End keys (as Fn + Up/Down/Left/Right) takes a while to get used to. The speakers are decent for a laptop, and the microphone is excellent. The webcam is placed in an odd location (lower left of the screen), but it has quite nice resolution and focus quality. And Bluetooth and WiFi, well, they "just work". I got 98.2 Mbits/sec of throughput over WiFi. 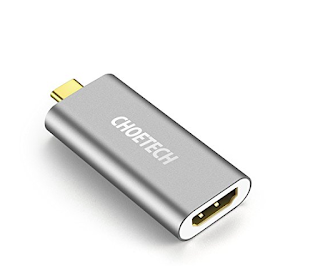 There's no external display port, so you'll need something like this USB-C-to-HDMI adapter to project to a TV or monitor. There's 1x USB-C port, 2x USB-3 ports, and an SD-Card reader. One of the USB-3 ports can be used to charge your phone or other devices, even while your laptop is suspended. I use this all the time, to keep my phone topped up while I'm aboard planes, trains, and cars. To do so, you'll need to enable "USB PowerShare" in the BIOS. Here's an article from Dell's KnowledgeBase explaining how. Honestly, I have only one complaint... And that's that there is no Trackstick mouse (which is available on some Dell models). I'm not a huge fan of the Touchpad. It's too sensitive, and my palms are always touching it inadvertently. So I need to use an external mouse to be effective. I'll continue to provide this feedback to the Dell team, in the hopes that one day I'll have my perfect developer laptop! Otherwise, this machine is a beauty. I'm sure you'll love it too. In summary -- your feedback matters! There are hundreds of engineers and designers working for *you* to continue making Ubuntu amazing! 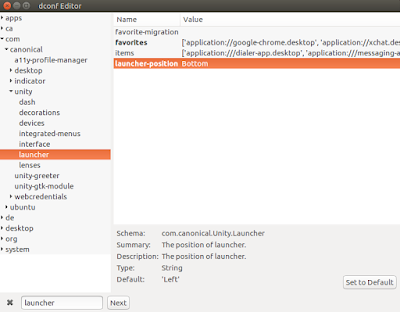 Along with the switch from Unity to GNOME, we’re also reviewing some of the desktop applications we package and ship in Ubuntu. We’re looking to crowdsource input on your favorite Linux applications across a broad set of classic desktop functionality. We invite you to contribute by listing the applications you find most useful in Linux in order of preference. To help us parse your input, please copy and paste the following bullets with your preferred apps in Linux desktop environments. You’re welcome to suggest multiple apps, please just order them prioritized (e.g. Web Browser: Firefox, Chrome, Chromium). If some of your functionality has moved entirely to the web, please note that too (e.g. Email Client: Gmail web, Office Suite: Office360 web). If the software isn’t free/open source, please note that (e.g. Music Player: Spotify client non-free). If I’ve missed a category, please add it in the same format. If your favorites aren’t packaged for Ubuntu yet, please let us know, as we’re creating hundreds of new snap packages for Ubuntu desktop applications, and we’re keen to learn what key snaps we’re missing. In the interest of opening this survey as widely as possible, we’ve cross-posted this thread to HackerNews, Reddit, and Slashdot. We very much look forward to another friendly, energetic, collaborative discussion. Why? Because every single Linux-based phone, router, modem, tablet, desktop, PC, server, virtual machine, and absolutely everything in between -- including all versions of Ubuntu since 2007 -- was vulnerable to this face-palming critical security vulnerability. Coincidentally, just before the vulnerability was published, we released the Canonical Livepatch Service for Ubuntu 16.04 LTS. 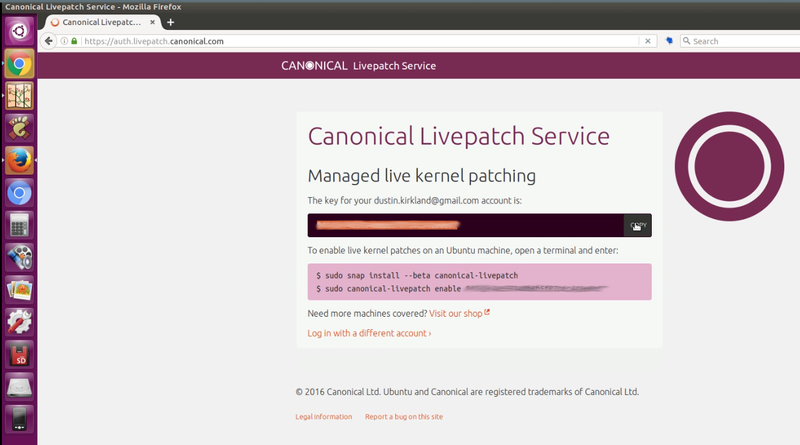 The thousands of users who enabled canonical-livepatch on their Ubuntu 16.04 LTS systems with those first few hours received and applied the fix to Dirty COW, automatically, in the background, and without rebooting! So that's the Ubuntu 16.04 LTS kernel space... What about userspace? Most of the other recent, branded vulnerabilities (Heartbleed, ShellShock, CRIME, BEAST) have been critical vulnerabilities in userspace packages. 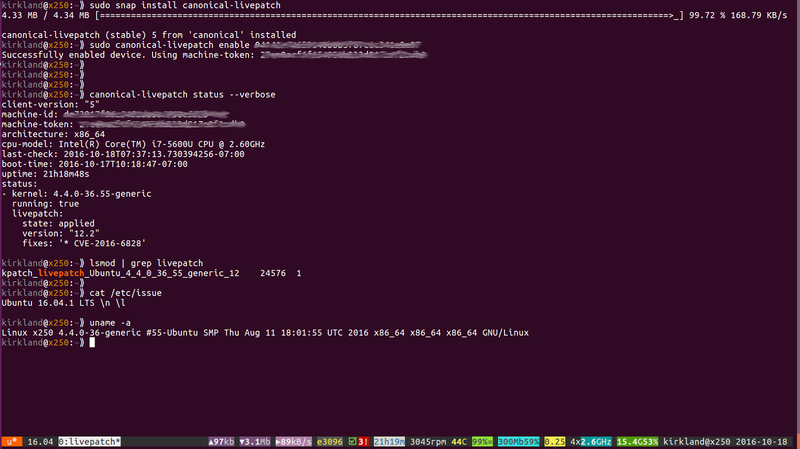 With that combination enabled -- (1) automatic livepatches to your kernel, plus (2) automatic application of security package updates -- Ubuntu 16.04 LTS is the most secure Linux distribution to date. Period. and we haven't even officially released yet! 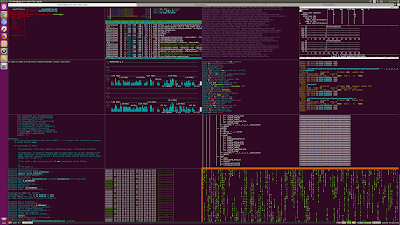 216,475: A complete archive of all binary .deb packages in Ubuntu 16.04 LTS consists of 216,475 debs. 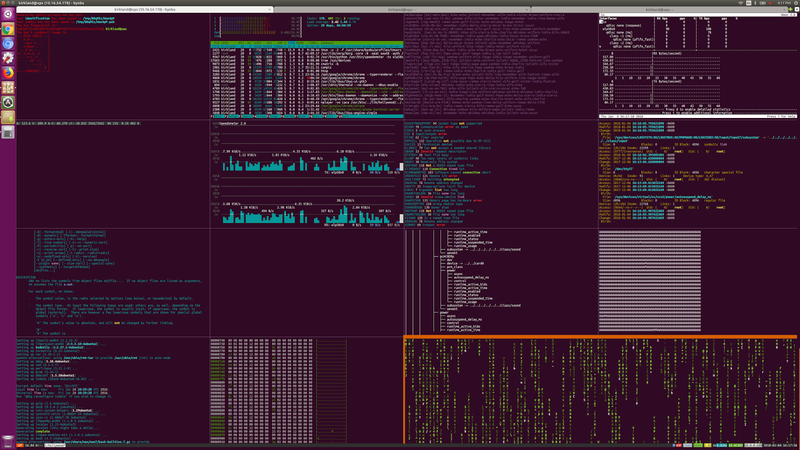 Yes, that's 1.4 billion lines of source code comprising the entire Ubuntu 16.04 LTS archive. What an amazing achievement of open source development! 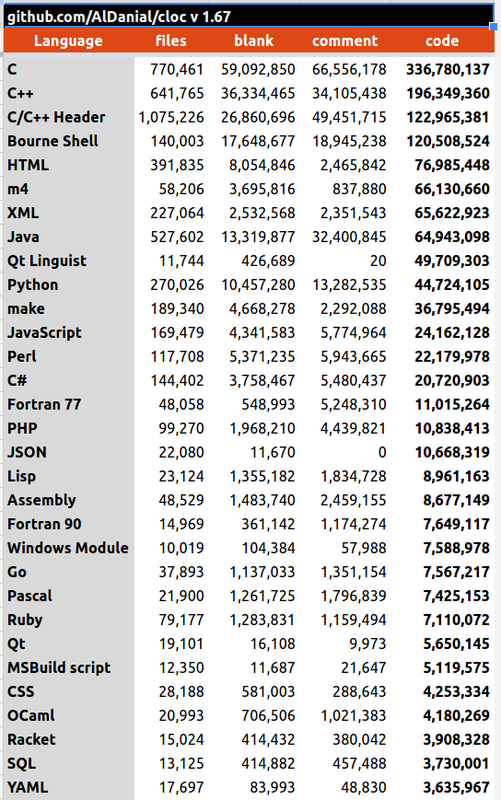 Perhaps my fellow nerds here might be interested in a breakdown of all 1.4 billion lines across 25K source packages, and throughout 176 different programming languages, as measured by Al Danial's cloc utility. Interesting data! You can see the full list here. What further insight can you glean? 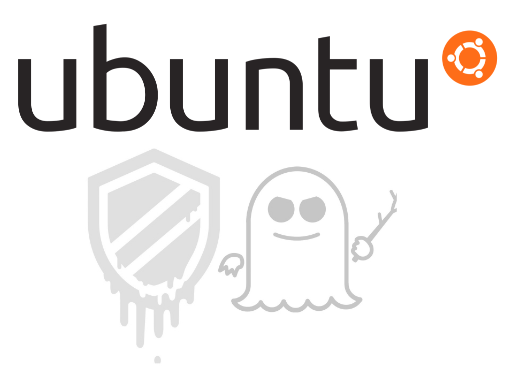 With the recent introduction of Snappy Ubuntu, there are now several different ways to extend and update (apt-get vs. snappy) multiple flavors of Ubuntu (Core, Desktop, and Server). We've put together this matrix with a few examples of where we think Traditional Ubuntu (apt-get) and Transactional Ubuntu (snappy) might make sense in your environment. Note that this is, of course, not a comprehensive list. A: You want our Traditional Ubuntu Core. This is often useful in building Docker and LXC containers. A: You want Snappy Ubuntu Core. A: You want Ubuntu Touch, which is a very graphical human interface focused expression of Snappy Ubuntu. A: You want the traditional apt-get Ubuntu Server. 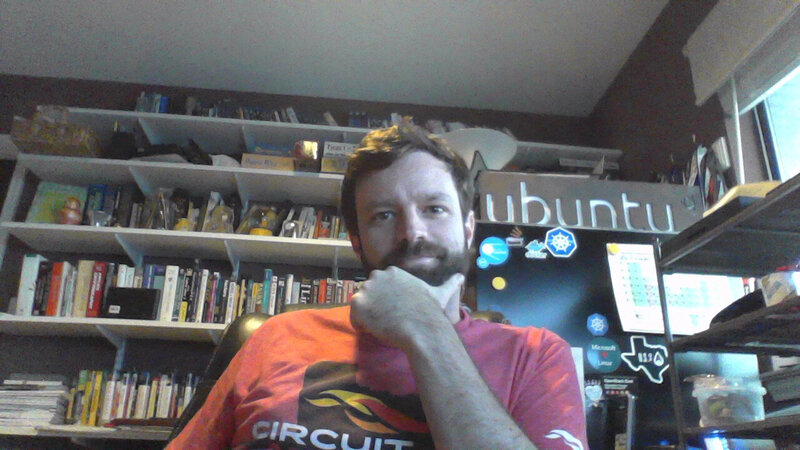 Q: I'm developing and debugging applications, services, or frameworks for Snappy Ubuntu devices or cloud instances? 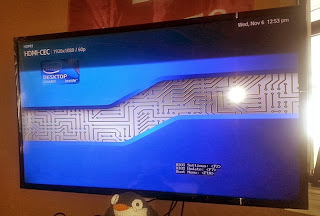 Last week, I posed a question on Google+, looking for suggestions on a minimal physical format, x86 machine. 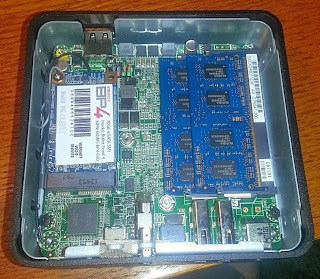 I was looking for something like a Raspberry Pi (of which I already have one), but really it had to be x86. I was aware of a few options out there, but I was very fortunately introduced to one spectacular little box...the Intel NUC! The unboxing experience is nothing short of pure marketing genius! The "NUC" stands for Intel's Next Unit of Computing. It's a compact little device, that ships barebones. 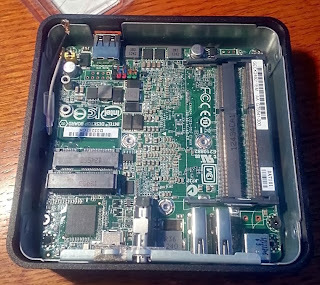 You need to add DDR3 memory (up to 16GB), an mSATA hard drive (if you want to boot locally), and an mSATA WiFi card (if you want wireless networking). 4.6" x 4.4" x 1.6"
Quite simply, I couldn't be happier with these little devices! I used one of these to replace the dedicated audio/video PC (an x201 Thinkpad) hooked up in my theater. The x201 was a beefy machine, with plenty of CPU and video capability. But it was pretty bulky, rather noisy, and drew too much power. And the other two are Baby-buntu baby monitors, as previously blogged here, replacing a real piece-of-crap Lenovo Q100 (Atom + SiS307DV and all the horror maligned with that sick chip set). All 3 are now running Ubuntu 13.10, spectacularly I might add! All of the hardware cooperated perfectly. Here are the two views that I really wanted Amazon to show me, as I was buying the device...what the inside looks like! 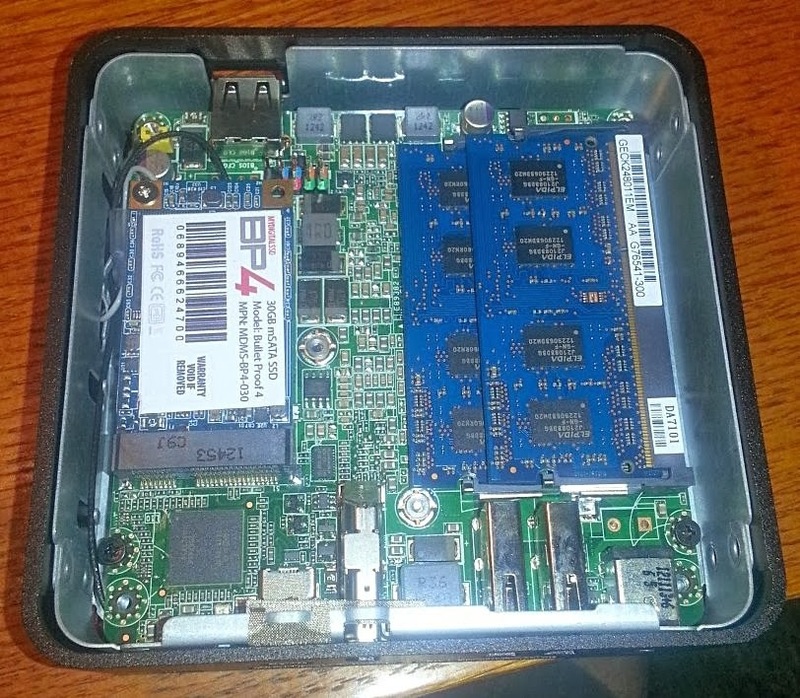 You can see two mSATA ports and red/black WiFi antenna leads on the left, and two DDR3 slots on the right. On the left, you can now see a 24GB mSATA SSD, and beneath it (not visible) is an Intel Centrino Advanced-N 6235 WiFi adapter. On the right, I have two 8GB DDR3 memory modules. The BIOS is really super fancy :-) There's a mouse and everything. I made a few minor tweaks, to the boot order, assigned 512MB of memory to the display adapter, and configured it to power itself back on at any power loss. 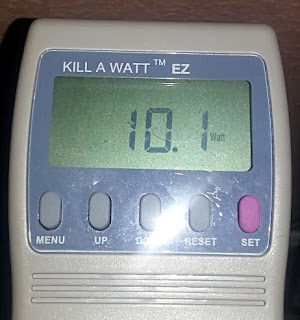 Speaking of power, it sustains about 10 watts of power, at idle, which costs me about $11/year in electricity. 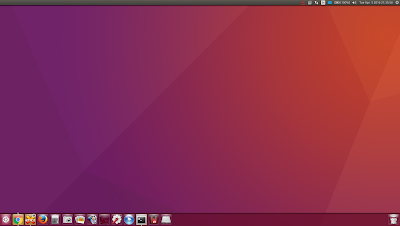 5.1 Ubuntu Login Sound now in a PPA! Remastered based on the original wav files, since my previous version was based on the lossy, compressed ogg files. Adjusted a couple of levels, having actually tested it on as many different 5.1 and 2-channel stereo environments I could find. 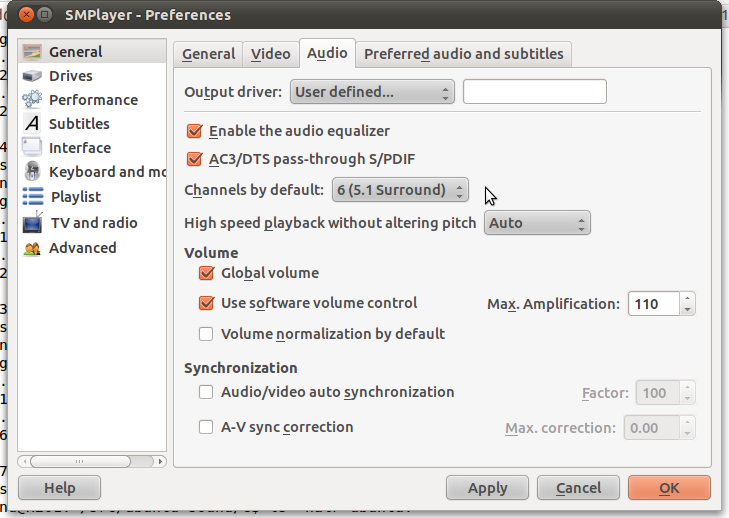 Updated the ubuntu-sounds package and pushed to bzr and a PPA for easier installation on lucid, maverick, natty, or oneiric! 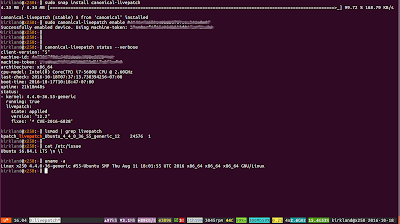 Finally, if you'd like to see this land in Ubuntu, mark bug #834802 as "affects me too"! It was way too hot here in Austin, Texas this weekend, as it hit 110F on Sunday! So I spent most of the heat of the day inside, toying with something that I think is pretty cool :-) I couldn't find any OS today (Mac, Windows, or Linux) that has a 5.1 channel login sound... I'm hoping that Ubuntu might be the first! I have 7.1 channel surround sound in my home theater, which is great for watching movies. 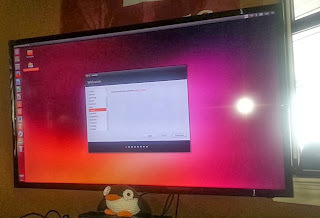 Hooked up to my projector is (of course) an Ubuntu nettop, which I use to stream and serve most of my media content. I thought it would be neat to remix the Ubuntu login sound in 5.1 channels, to exercise my theater's surround sound at boot. 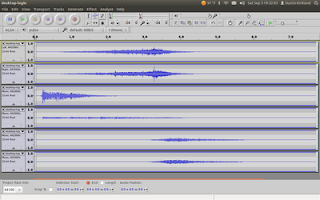 So I grabbed the familiar "drums and crickets" OGG file, which you can find at /usr/share/sounds/ubuntu/stereo/desktop-login.ogg, and opened it in audacity, a phenomenal open source mixer. I split that stereo track into two mono tracks, and then added four more blank tracks. The first two tracks are the Left and Right channels, respectively, followed by the Center channel, the Sub woofer channel, and then the Surround Left and Surround Right channels. 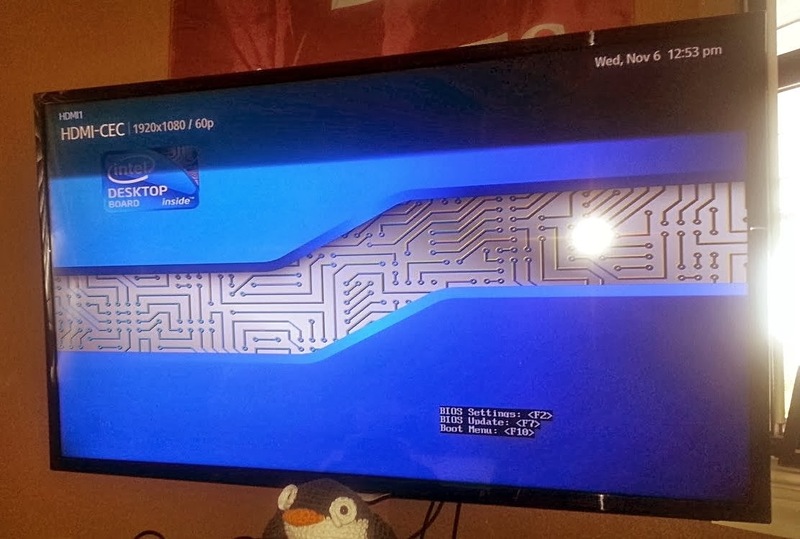 I copied the Left and Right channels to the Surround Left and Surround Right channels. Then, I opened the original desktop-login.ogg again, and mixed that stereo track to a single mono track. I took that mono track and copied it to the Center and Sub woofer channels. Okay, now I had 6 tracks ... time to start playing with them! I decided that I wanted the "crickets and wind" at the end of the clip to be exclusively in my rear, surround channels. 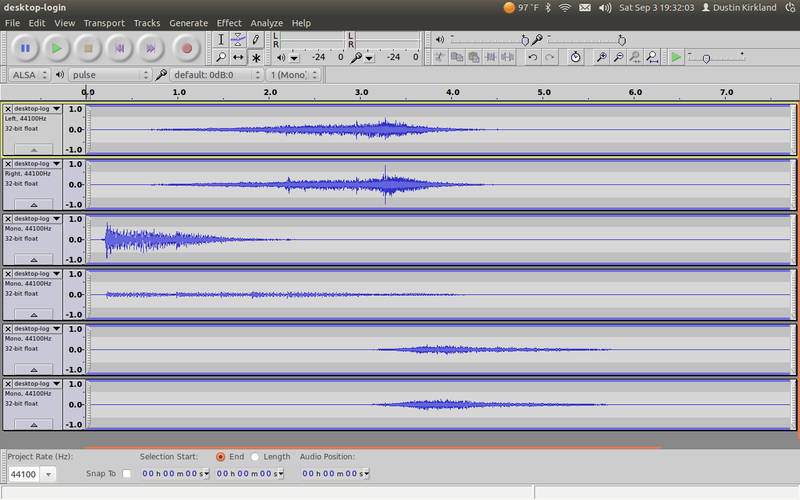 So I silenced the Surround Left and Surround Right tracks until about the 3.85 second mark, and then faded in from 3.85 seconds to 5.43 seconds, and faded out from 5.43 seconds until the end of the clip. Since I wanted that sound exclusively in the rear channels, I silenced each of the Left, Right, Center, and Sub woofer channels from the 5.0 second mark, until the end of the clip. 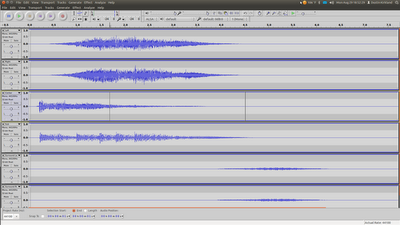 Next, I smoothly faded out the Left and Right channels from about 2.21 until the 4.54 second marks. For the intro, I wanted the first few drum beats to emanate from the center channel, and then spread wide to the Left and Right channels, right up to the big cymbal crash and the crescendo of the clip. 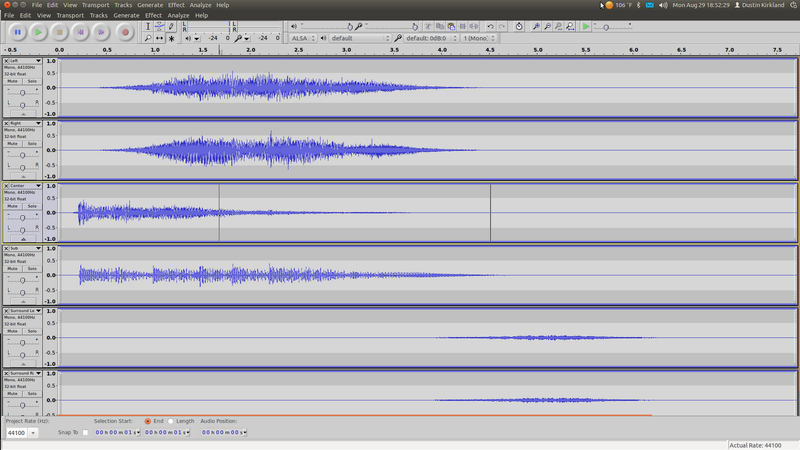 So I took the Center channel and added a very long fade, from the 0.30 second mark until about 3.97 seconds. And then I set the Left and Right channels to slowly fade in, from 0 seconds to about 1.48 seconds. Finally, I took the bass track and de-amplified it way down. And then I applied a low-pass bass boost filter several times, until the lowest hits of the bass drum are the only audible parts of the track. Want to hear it for yourself? Well, you'll have to have 5.1 speakers in a true Surround Sound setup... 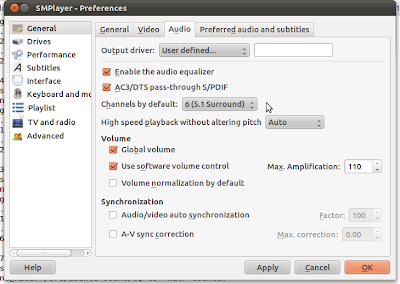 If so, grab the [flac, ogg, or wav] file, and open it in smplayer, ensuring that you have 5.1 channel sound enabled in smplayer. With the right equipment, you should be in for a treat! The first few drum beats you'll hear in your Center channel along with some solid, thumping bass hits. The sound should spread quickly from the Center, fanning outward toward your Right and Left channels right up to the big crashing cymbal! And with that crescendo, the Left, Right, Center, and Sub should all gracefully fall silent, while the crickets and the wooshing wind sweep back to your Rear Left and Rear Right channels! Don't have 5.1 sound? Well, you can still listen to each track individually. Grab the [flac, ogg, or wav] file, and open it in audacity. You should see 6 channels vertically down your screen. You can click the Solo button next to each track, and listen to each track one-by-one. Make sure you un-click the Solo button between plays. This might give you a decent idea of how each of the channels come together. So I signed the petition and was impressed to see 16,518 other signatures! 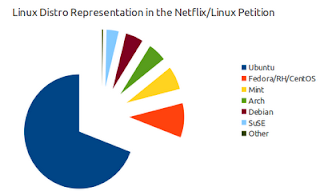 In fact, I downloaded all of the signatures and did a little (far from scientific) grepping of my own to see where Ubuntu stood among the other desktops in the signature list. 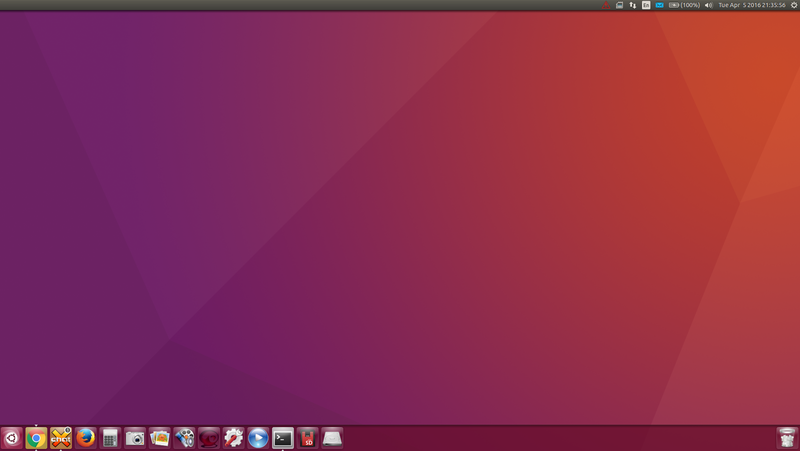 Ubuntu lands at nearly 70%. Impressive!